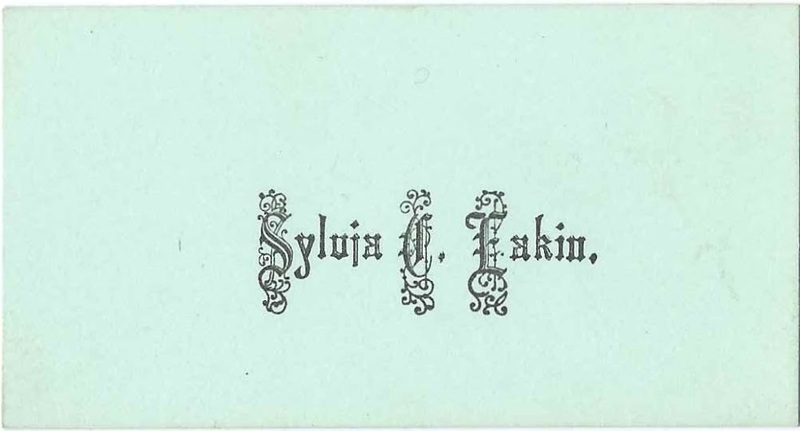 Calling card of Sylvia C. Lakin, presumably the Sylvia C. Lakin from Franklin County, Maine. Not only was the card found with others from Franklin and Somerset Counties in Maine, but one of the cards, featured in another post, was that of Joseph Warren Allen of New Sharon, Maine, whose brother, Benjamin Franklin Allen, would become Sylvia's husband in 1887. 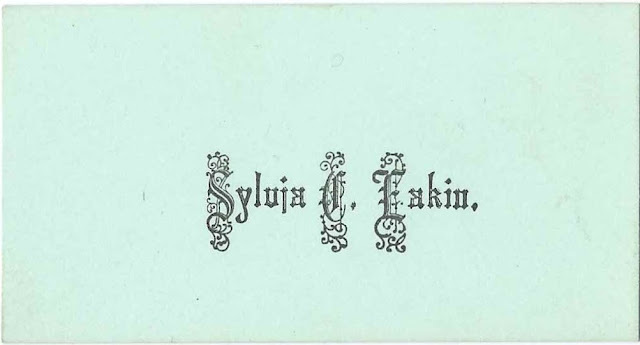 Sylvia C. Lakin was born November 17, 1865, possibly at New Sharon, Maine, the daughter of Nathanial Lakin and Nancy J. Morse Lakin. At the time of the 1870 and 1880 Censuses, Sylvia and her family were living at Chesterville, Maine. On July 12, 1887 at Auburn, Maine, Sylvia married Benjamin Franklin Allen, son of Benjamin Allen and Eliza Ann (Coombs) Allen. Sylvia and Benjamin lived at Mount Vernon, Maine, where Benjamin was in the grocery business with his brother Joseph Warren Allen. I didn't find records of children born to them. Benjamin died in 1948 and Sylvia in 1954. They're buried in the Riverside Cemetery at Farmington, Maine.